This recipe is a classic from my childhood in France. My mom always made it with cherries. This time I used peach that had been in my refrigerator for a week, and needed to get eaten. You can use any summer fruit, just keep in mind baking time may vary based on the fruit used. The classic clafoutis made with cherries takes 35 to 40 minutes to cook. 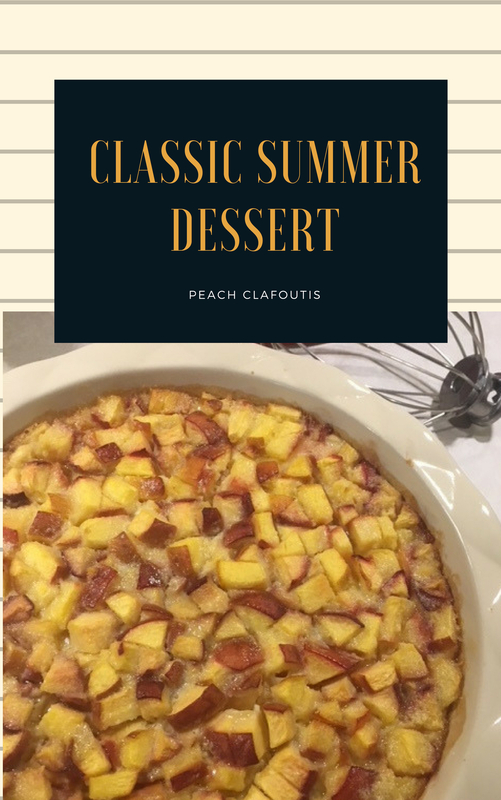 This Peach Clafoutis took 1 hour. You can use a cast iron skillet or a heavy pie pan that retains the heat well. It's easy to make and absolutely delicious. 2 cup Cubed Fresh Fruit of your Choice Cherry (Whole), Peach, Pear, Apple, Grape, etc. In a large mixing bowl, whisk the milk, eggs, sugar, vanilla, and melted butter together until the sugar is completely dissolved. Add the flour and mixed until smooth. Pour the batter into a cast iron skillet or pie pan. Add your fruit. There is never too many fruits in a clafoutis. Bake for 35 to 40 minutes or more. The clafoutis will puff up like a soufflé, browned on the edges, and creamy within. It will deflate when you take it out of the oven, but do not worry it is normal. When cooked, it has the consistency of a flan. Weight Watchers Dessert Recipe: 6 points per serving. Previous Post How to Start Planning your RV Life? Next Post A Holiday Getaway – Gift an Experience this Holiday Season!